Why I Don’t Worry About Sugar - Where Do Gorillas Get Their Protein? You wrote that it’s “easy to fat­ten on fats.” I won’t dis­pute that, but from a prac­ti­cal stand­point, no one real­ly eats fat by itself. But­ter by itself is pret­ty gross! haha. It’s var­i­ous com­bi­na­tions of fat, carbs, and pro­tein that cause peo­ple prob­lems. The carb/ fat com­bi­na­tion seems to be par­tic­u­lar­ly palat­able (ice cream, choco­late, pas­tries, etc.) It seems like it’s the palata­bil­i­ty of foods that leads to overeat­ing, which leads to weight gain. Maybe that’s one of the rea­sons why peo­ple can lose weight on low carb diets, because it reduces that addic­tive carb/ fat com­bi­na­tion. A low fat diet would do that, too, of course. It doesn’t real­ly mat­ter whether the fat is “by itself” or fried into a donut, does it? Yes, it mat­ters a great deal. Because but­ter, veg­etable oil, short­en­ing, etc., are not palat­able by them­selves, but a donut is extreme­ly palat­able! That donut isn’t just fat, it’s fat + sug­ar + refined flour. I’m just say­ing that, in real world con­di­tions, we’re far more like­ly to overeat that fat when it’s made palat­able via var­i­ous com­bi­na­tions of refined sug­ar, refined flour, salt, and, of course, fat. I’m speak­ing from per­son­al expe­ri­ence because this is some­thing I’m strug­gling with right now. I’m try­ing to reduce my intake of high­ly palat­able foods (fat + sug­ar + flour + salt) and need­less to say, it’s extreme­ly dif­fi­cult. Are you real­ly “overeat­ing” or sim­ply eat­ing the wrong food? To get enough calo­ries from eat­ing leafy veg­eta­bles, you’d have to eat 12 pounds of food per day. To get enough calo­ries from just pota­toes, you’d have to eat 20 medi­um pota­toes a day. That’s a vast vol­ume of food when com­pared to the amount of donuts that it would take to make you fat. If you sim­ply cut out the fat­ty foods alto­geth­er and ate a lot more fiber, your weight would almost cer­tain­ly reg­u­late itself. You could even eat some sug­ar. That’s a good point. It’s prob­a­bly a bit of both. Overeat­ing the wrong food! That’s the key. I guess, the­o­ret­i­cal­ly, one could eat one donut per day, which wouldn’t cause weight gain. Much eas­i­er said than done though. The prob­lem with these foods is not just the calo­rie den­si­ty, but the lack of por­tion con­trol. Maybe it’s because they affect brain chem­istry or what­ev­er, but it’s real­ly hard to eat these foods in mod­er­a­tion. It’s not one donut that’s the prob­lem, it’s two or three or four donuts! I have noth­ing against reduc­ing fat, of course, oth­er­wise I wouldn’t be read­ing your blog. 🙂 But if some­one decid­ed to cut out all refined sug­ar and white flour, they could do pret­ty well, too, don’t you think? For exam­ple, lot of peo­ple drink too much soda, which is pure sug­ar. Some peo­ple drink sev­er­al cans of soda per day. For­tu­nate­ly, that’s not my prob­lem, I haven’t drank soda reg­u­lar­ly since I was 12 or 13. I’m all about the fat/ sug­ar com­bo! haha. But it’s a big prob­lem for lots of peo­ple. Get rid of added sug­ars, fats, and oils, and a 2600 calo­rie Amer­i­can diet becomes a 1600 calo­rie diet! (Bar­ring sub­sti­tu­tions, of course.) Sug­ar + fat + flour = lots of calo­ries. Wow. Also, don’t for­get that a lot of the calo­ries from the meat, poul­try, fish, and eggs and dairy foods also come from fat! I was a lit­tle sur­prised by the calo­ries from fats and oils. 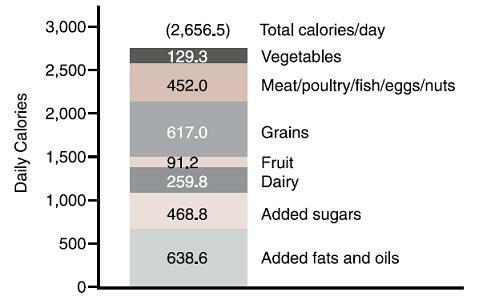 I know peo­ple eat a lot of fried foods, and use but­ter and oils for cook­ing, but over 600 calo­ries per day is a lot. And only 90 calo­ries per day from fruit! That’s sad. 90 calo­ries is a medi­um size apple, and noth­ing else. I’ve actu­al­ly heard peo­ple say that they don’t like fruit. Weird. What’s not to like? It’s like the aggres­sive fla­vor­ing of processed foods has dis­tort­ed our per­cep­tion of what tastes good. Maybe they’ve nev­er eat­en real­ly fresh fruit? Next Next post: Bill Clinton Eats Plants!